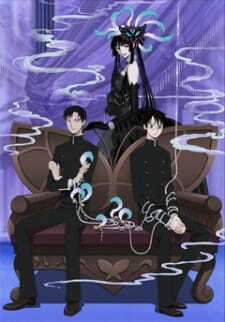 xxxHOLiC - Kei is the sequel to the first xxxHOLiC anime which is an adaptation of the CLAMP manga of the same name. - Fans of the manga might be let down at the lack of references to Tsubasa Chronicles this far into the story. Enjoyment: xxxHOLiC - Kei was really an incredibly fun anime to watch, I just didn't feel like stopping, mainly because I loved the characters and the plot. Overall: xxxHOLiC Kei is a great sequel to a great anime that is adapted from a great manga. But even as great as the anime is I highly recommend you read the manga since there is a lot of IMPORTANT material that was left out of both anime adaptations. If you like slice of life and supernatural animes, then by all means watch xxxHOLiC, its one of the best at doing both at once. Still creepy, still mysterious, still fascinating, and still cryptic, xxxHOLiC Kei is the follow up to the first Holic, bringing along with it a new raft of ideas. The new season does many of the same things as the previous. There's more of the supernatural, more cultural insights, and more social commentary. Ghosts, spirits, and psychics all return en masse, escorted by Mahjong lessons and the depravity of internet media. However, Kei did well in respect to bringing up some more social concerns just like the first season. One small example being the introduction of Watanuki's newest friend, Kohane. Through her, Kei gives another candid view of society and how the problem of prejudice affects people. Of course, this wouldn't be xxxHOLiC without more mind-boggling questions about fate, destiny, and choices. They're another integral part of the anime, helping to make the story even more compelling. With respect to the plot, Kei started off on the wrong foot for me. The very first story arc seemed rushed, with too little preamble to make the flow natural. Yet in the overall scheme of things, it became clear that the individual episodes were once again the agents of character development. This realization made me appreciate how the plot was truly structured, and to other viewers, the slightly rickety pace will become clearer as the series progresses. Hence, moving on into character development, it has to be said that there was remarkably more in Kei as opposed to the first Holic. True, Watanuki still performs his insane stunts of protest against Doumeki's stoic nature, and Himawari still comments that they're the best of friends. However, Watanuki does develop, changing the group's dynamic considerably throughout the course of the series. As for Yuuko... well, she's still a combination of a serious all-knowing psychic goddess and frivolous alcoholic, but that's just another one of the reasons I can't stop watching. In the fields of art and sound, much of Kei is similar to its predecessor. People still have arms and legs that are a little too long, but the artwork still retains its great quality. Heck, even the food looks appetizing. It turns out that there were some differences in sound, but only with the opening song. It was a little more upbeat than the old one, and definitely retracted from the ominous ambiance. Other than that, I still considered it quite catchy. Regardless of all of the above, I was glued to this show and couldn't let it go. I laughed at the comedy, shivered at the creepy parts, and felt sad whenever misfortune fell upon the characters (well, not really). Anyone who loved the first Holic absolutely must get their hands on Kei. And while they're at that, let's all keep an eye out for a third season. First let me say I truly enjoyed the first season and the art is just as striking but Kei is a total waste of characters with tremendous potential. - Try this out: the rain sprite, the Ame-warashi, standard mood is bad but she always sees the good in people; the vestal sprite, the Zashiki-warashi, is innocent and virginal she lives on pure, as in virginal, energy and is very susceptible to evil energy; the beautiful human spider, Jorougumo thrives on that evil energy; almost all the other secondary characters are just as vivid and unique - and CLAMP doesn't do a damn thing with them. To top it off the lead female, Yuuko, could have been one of the great females in anime but they turn her from the super dominant, supernatural witch of the first season into an insipid drunk whose only purpose is exposition. To someone who watched all the first season episodes at least twice the second season is an insult. Worth Watching? : Watch season 1, then decide. Welcome to WanderAgain's very biased review! Story 2.2/2.5: Season 1 drew me in with it's entrancing portrayal of folklore and mysticism. This season did very little of that. Perhaps, it wasn't a mistake. Although the many magical layers of season one were one of xxxHolic's strongest points. Somehow, in some way, CLAMP managed to pull it away from that focal point and still do a great job. Kei was a more character-centric season, with minor magical elements mixed in. Much of it, interestingly, reminded me heavily of episodes from Jigoku Shoujo (Hell Girl). These episodes were surprisingly enjoyable, and even made me feel what little feelings I have left. What didn't amuse me, was the filler episode in the middle of the season. Who, other than xxxHolic, can get away with basing an entire episode on the game Mahjong? Literally, there is a Mahjong episode. Hardly any actual plot was completed in this episode. For a 13 episode series, I'm a little confused as to why they'd dedicate their resources to characters playing Mahjong. If it weren't for how enjoyable the main cast was, I'd probably be a lot more upset. But still, there's a Mahjong episode. Art 1.6/2.5: In the case of xxxHolic, I both really love CLAMP and really hate CLAMP. For season 2 of xxxHolic, the art was terribly inconsistent. Most of the time, you were greeted by horribly drab backdrops that really didn't seem to fit with the rather unique character designs. However, on specific scenes, where some sort of important story element is brought to attention, the art is just phenomenal. Vibrant and magical, they highlight the true potential of CLAMP working with Production IG. This pains me, really; I would've like to see further effort into the everday scenes, rather than just a few poorly colored Japanese city houses. some new content. It gets a bit repetitive at times. Characters 1.9/2.5: Welcome back the screamy headed nerd, Watanuki. Thankfully CLAMP's efforts this time around seemed to focus on the relationships between each character, and their subsequent development. Watanuki's growth has been a slow burn that finally fizzles out in Kei. He and Doumeki undergo a time of change, and it's splendid. As for new characters introduced... Fantastic! A certain young female character blew my little mind in many different directions. She was wonderfully crafted, and well portrayed. There is however a flaw, too major to ignore. Himawari. Oh Himawari. You beautiful bastress, how they changed you so. Himawari's characterization in Kei was ridiculously poor. It was laid out so strangely and suddenly that I even question calling it characterization. Aside from this major disappointment, I also really miss the Warashi. Just a warning, our enticing duo get very little screen time. They were quite dynamic (or at least interesting) characters that were not fully explored in Season 1.
woman. I tell you what.